AV design and integration for Prysm’s Cascade 117 collaboration video wall solution at Wipro’s Custmer Experience Center was completed by Avidex Industries, located in Fremont, California. 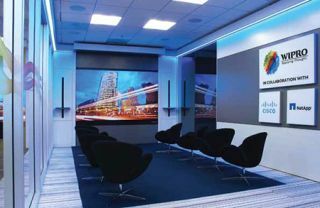 Prysm has installed a Cascade 117 collaboration video wall solution at the Wipro Customer Experience Center (CEC) in Mountain View, California. Wipro Limited is an information technology, consulting, and business process services company that delivers solutions to enable its clients to do business better. The Wipro CEC is designed to demonstrate emerging technologies, test proof of concepts, and give customers the opportunity to see the latest data center, enterprise, and cloud solutions in realworld, real-time scenarios. It also uses the latest immersive, collaborative, and interactive demonstration technologies available in the industry. The Wipro CEC aims to give customers the environment they need to drive pilots and test new solutions before enterprise deployment. Wipro wanted a system that would showcase its many solutions to customers and provide a platform for collaborative content development. An important objective was achieving the means to shift from passive presentations to an active engagement experience. The Cascade 117 video wall creates a 42-square-foot digital canvas for collaboration and interactive demonstration of the breadth of Wipro’s leading technology and service solutions. Cascade collaboration video walls combine the most advanced high-definition, low-energy, virtually seamless displays with touchenabled interaction. Users can present, share, reposition, resize, annotate and edit all types of content through on-screen touch, PCs, or mobile devices. Multiple, simultaneous live inputs can be displayed and interacted with on screen, including video, telepresence, and web apps. Configurable workspaces allow teams to share the use of a Cascade system with other groups, save their work between sessions, and pick up where they left off when they next meet. Prysm’s Cascade series is specifically designed for visual collaboration and is available in four standard sizes from 65-inches to 190-inches diagonal. Prysm also provides custom-sized Olympic video walls tailored for customers’ specific needs.